It appears the driver works with only a minor change. Originally the driver detected the USB to NIC adapter that I had, but it timed out. So once I setup a test environment. I looked over the code and noticed something peculiar. It appeared the AX88772A adapter I had [ 0x0b95, 0x772a ] was "misclassified"
I reasoned it was being initalized as a 1000 Mbps device, when it is actually a 100 Mbps device. So I moved the definition to the other category and recompiled. It pulled a dhcp address from my local network and appeared in the leases file for my local lan dhcp server. Hardly worth a changelog edit. Next task is to see if I can pull a PXE bootable image and boot into that kernel image. So weirdness "aside" we can conclude the usb subsystem and the usb driver in the gPXE image does indeed work. The error message "Could not load gPXE" is displayed. an entire track at once. The size of the image is not taken into account here. equal to the gPXE image size rounded up by 32 KB. than the gPXE USB image size and aligned to 32KB (sectors-per-track). ...for the USB nic (or detecting that it is indeed bootable). Summary is the Boot Firmware Table is not being updated by the detection of the USB nic. If a second virtual nic is added and detected by gPXE it will indicate the USB nic designated nic0 is "inaccessible" and attempt to use the second virtual nic.. which would not be a valid test. Which suggests to me the insertion or detection code should be making a call to a function that updates the device list, but is not.. if that can be found and called.. everything should work as expected. Which indicated it was trying to source the boot file name from the dhcp call for net0. And now the wonky part.. 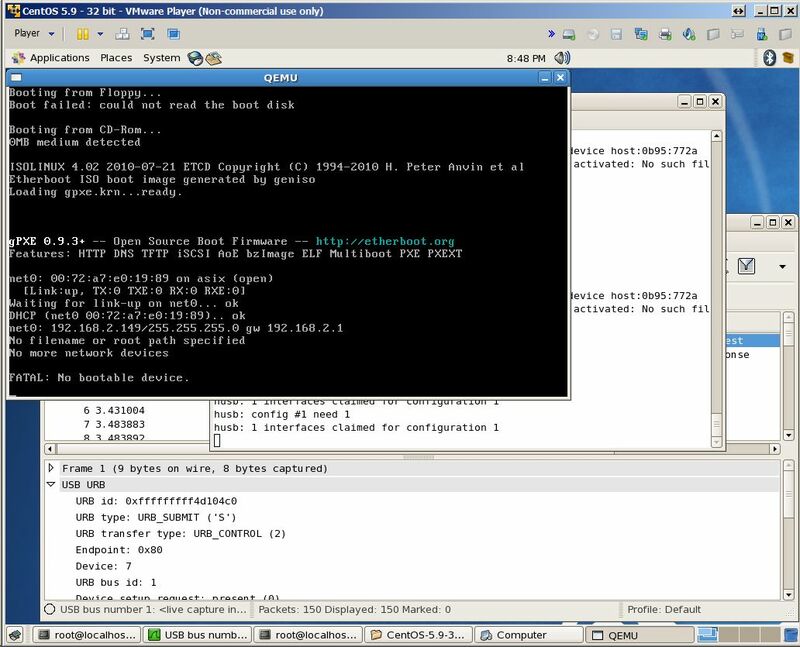 The qemu arguments for booting from a nic and providing a bootp file path are still required or it doesn't work.. I'm not sure why.. but that tells me for some reason the arguments from qemu are not being sourced when attempting to boot from net0 but they are being sourced when booting from net1. That kind of leads me to believe the problem is with qemu and the way it handles arguments for nic devices it supports. Since the usb nic is being "passed-through" using usbdevice instead of emulated it could be the bootp option isn't interacting with the enumeration mechanism properly. Bottom line: I think this problem lies in [qemu] and the USB pass through, not with gPXE. Its very possible that booting gpxe.usb from a flash stick or gxpe.iso media it won't be a problem, the USB Ethernet device will be detected, and the Boot File path will be used to pull down a configuration file to further download the next stage. Actually this is kind of okay.. because that means the gpxe.usb image can be generic, and its boot target is set by the dhcp server and then any processing logic for selecting the image would be up to the http server providing the target file gtest.gpxe (http processing could hand out a different file based on IP address for example).. which was assigned based on mac addr or even mac vendor code anything dhcp can key off of when assigning an IP. (Or) the next stage could be a menu selector that download other choices.